I love books. Really love books. This is my sciencey/education book shelves. I’ve just moved house and there are still some books packed away. My main university text is missing from my shelves (University Physics: Young and Freedman). 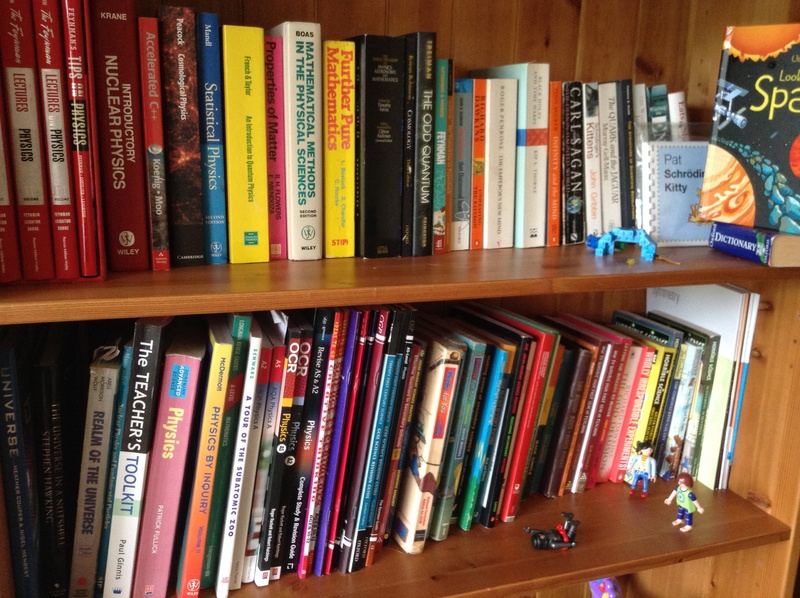 As well as some of the books I’ve use a lot for teaching that are at work (inc. The Resourceful Physics Teacher and A Level Physics: Relativity and Quantum Physics). There must be another box of books hidden away in the garage too. I can’t think what’s missing, but there doesn’t seem to be enough! I love books for many reasons. They are often attached to memories. The text from my favourite university course is up there. I see some of the popular science books I read as a teenager. They opened my eyes up to whole new worlds I knew nothing about. Finally, my amazing copy of The Feynman Lectures was a gift I received after having my first child. I’m sure most people hope for diamonds at this point in their lives (or nothing, if the whole concept of a push present disgusts and appals you! Ha!) They are now available online. I love being able to look up things I’m teaching, or have recently read about to get the Feynman Lectures take on it. Books help me teach. If I am teaching something I haven’t thought about for a while I can use them to remind myself of the main ideas. If a student is struggling to understand a particular concept I can look in them to find someone else’s explanation that may help. Recently I’ve used some of these books when students have wanted a more advanced understanding of a topic than we go into in class. A lot of these things happen during discussions with people too, but I do love trying to find answers out for myself with a book. It’s not just physics ones. I try to read at least one non-fiction book a month. Failing badly this year though. My classroom ‘Miss Audsley is reading… ‘ poster has got seriously stuck on The Bell Jar. Image | This entry was posted in books and tagged books, classroom, education, imagination, inspiration, literature, Physics, science, teaching. Bookmark the permalink. May be it’s a physics thing, but I also have a book problem ( I believe my colleagues in the physics dept do too) my book problem also extends to craft. Good luck with tracking down your books I’m still finding ones in odd places after moving 7 years ago. The shelf above is where my craft books live! I think my problem may be larger than yours, I have a large book case for craft & another for school stuff. My mothering law said our house is like a library , but then my in laws probably only own about 10 books ( none worth reading!). Hope your are enjoying your break from teaching.